Our surveyors will asses each building for its suitability and will then send a quotation by post that will not only confirm the cost (no hidden extras) but also include the predicted yield of the solar system, thus customers know in advance what the benefit will be in monetary and carbon reduction terms before they commit. 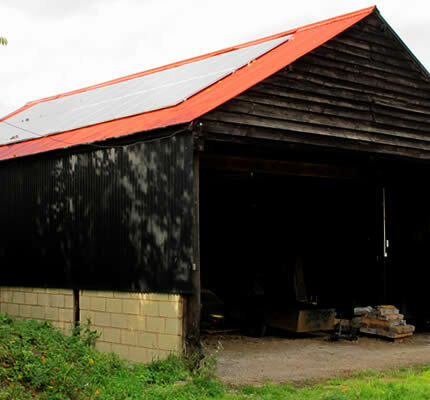 As a guide, a typical 18.7Kw solar system fitted to a barn or similar will cost in the region of £30,000 plus VAT and will deliver cash and energy savings benefits of over £115,000 during the 20 year period of the Feed in Tariff. Naturally, we appreciate that many new customers sensibly ask for a references. We have many customer testimonials than can be seen here. We also have an extensive register of referee’s so that we can put potential customers directly in touch with existing customers to have a one to one chat about us, our products and the service we provide. Not many solar installers are willing to do that!